The performance of small wind turbines including annual energy output. The Britwind(Evance) R9000, Bergey Excel-10, Skystream and Honeywell RT6500. Compared to their large turbine counterparts, small turbine manufacturers often do not have the same facilities and expertise to carry out turbine tests to obtain the power curves. In consequence, the accuracy of their power curves and the subsequent claims for mean power and energy production need to be treated with some caution and one of the aims of the WindPower program is to enable a potential user to carry out checks on the consistency of small turbine performance claims. It should be noted that the introduction of accreditation schemes like the US Small Wind Certification Scheme ,the UK's Microgeneration Certificate Scheme and the Danish Certification Scheme will do much to reduce inconsistent and inaccurate claims but until such schemes are widely in use, manufacturer's data often needs to be treated with some scepticism. Even small wind turbines are too large to be tested in wind tunnels and so the steady power curve for a wind turbine is deduced from tests in a natural wind in which the power output is fluctuating due to turbulent variations in the wind speed. The problem here is that the power output always lags behind changes in wind speed. The determination of the steady state response of a system from tests with randomly fluctuating inputs is a classical problem in system identification and it is not in general a simple problem. To overcome this difficulty, the International Electrotechnical Commission recommends a testing procedure (IEC 61400-12) that, whilst not strictly correct, will give power curves generally of sufficient accuracy for practical purposes. The procedure requires that the wind speed and power output in a normal wind are effectively logged instantaneously at intervals of one second or less. The power output data is then 'binned' at speed intervals of 0.5 metre/second and then an average value of power output obtained from the 'binned' values. 'Binning' means, for example, that all the power readings that occurred between wind speeds of, say, 8.0 and 8.5 metres/second are collected and their average taken as the power output that would be obtained in a steady wind of 8.25 metres/second. There is an assumption in this that the time lag for a step downward change in wind speed is the same as the time lag for an upward step change in wind speed and that the occurence of increasing and decreasing speed events within the 'binned' data are the same. Generally, the IEC procedure will give power curves of acceptable accuracy for practical purpose although some errors will arise from large gust events. Errors will also occur for turbines that use a tail fin to furl the turbine away from the wind at high wind speeds. This furling action behaves quite differently between increases in wind speed and decreases in wind speed. However, this too is not likely to be significant unless the turbine is operating at a very windy site where the furling action is in play for a good proportion of the time. Try to establish from the manufacturer how their power curves were obtained and, in particular, check whether or not the turbine has undergone independent accreditation tests. Check that the turbine efficiencies calculated from their power curves do not give rise to absurd peak efficiencies. Even a well-designed small turbine is unlikely to achieve a peak efficiency of greater than 30-35%. Compare the mean power and energy outputs calculated from their power curves with their claimed values. In many instances, claims for mean power or energy output are over-optimistic. Check items (2) and (3) are easily carried out with the WindPower program. Of course, there are many other factors that influence the choice of a turbine such as the cost, reliability, ease of installation, maintenance, noise levels and so on. However, if there are inconsistencies in the basic power data, it suggests that a potential user might need to examine other claims with care too. On the whole, the situation should get better with time because many countries now insist on proper accreditation trials which will include following the IEC's testing procedures. For the UK, those turbines that have received accreditation are listed on the Microgeneration Certificate Scheme website - MCS accredited wind turbines. For Denmark, those turbines that have received accreditation are listed on the Danish Certification website - Danish Certified wind turbines. This turbine has received the UK's Microgeneration Certificate as well as Danish certification. As a result, it will have been tested to IEC 61400-12 standards and so one can expect the data to be of a high standard and consistent. The Britwind (Evance) R9000 is a three-bladed 5.5 metre diameter upwind wind turbine with a tail fin. It uses a patented pitch control mechanism which it is claimed results in higher overall efficiencies than other small turbines and also limits the power output at high wind speeds to a constant level corresponding to the rated output of the generator of just above 5 kilowatts. It is a direct drive turbine (i.e. no gearbox) and the generator can also be used for emergency braking. The turbine does not have a cut-out speed. The figure below shows the data from which the power curve (the green line) was obtained as an average of the binned power and wind speed readings. The peak power is obviously electronically regulated so that there is a sharp cut-off at 5.2 kilowatts. The figure on the left below shows the power curve and the efficiency graph obtained from the WindPower program. The peak efficiency is about 35% which is plausible for a well-designed small turbine and occurs at about 7 metres/second. As can be seen from the previous web page, the peak efficiencies of large turbines are over 40% but this is probably not attainable from small turbines because the blade Reynolds numbers are much lower. The graph on the right shows the mean power produced for a range of mean wind speeds from 5 to 10 metres/second and is calculated for the Rayleigh probability distribution for the wind speed. The table below shows the equivalent annual energy production in kilowatt-hours obtained by multiplying the mean power results by 8,760 - the number of hours in a year. The results are compared with the annual energy production figures given in the MCS accreditation report. It is not the purpose of this website to advocate one small turbine rather than another but simply to show the checks that should be carried out on manufacturer's performance claims. In any case, there are many other issues such as reliability, noise and costs that have to be taken into account in deciding on a particular turbine but, generally, one might have more confidence in a design if the data on it is consistent and does not lead to exagerrated claims for overall energy output. The Bergey Excel is a popular US turbine design that has been around for some years and, in that period, it has undergone significant performance improvements. The latest version has been granted certification by both the US Small Wind Certification Council (SWCC) and the UK's Microgeneration Certificate Scheme (MCS) and thus has been tested to IEC 61400-12 standards. It has a blade diameter of 7 metres and comes with electrical regulators for connecting it either to a mains electricity system or for charging batteries. The Bergey unit uses a tail fin furling arrangement to turn the turbine away from the wind at high wind speeds. There is no cut-out speed and it is a fixed pitch design with direct drive to the generator. The earlier Bergey Excel (circa 2000) was subjected to of a number of independent tests by the American National Renewable Energy Laboratory (NREL) in Colorado. The reports are all available from the NREL website and give an interesting history of the evolution of the design. The figure below shows a scatter plot of mean power results obtained in the US and UK certification tests. The power regulation clamps the maximum power output to 12.5 kilowatts. The tailfin furling action trips in at about 15 metres/second and results in a slight increase in the scatter of the results above this speed. However, compared with the earlier designs, this scatter has been greatly reduced due to better control of the furling action. Because it is a fixed pitch design, the Bergey Excel 10 is mechanically a comparatively straightforward design which should contribute to its reliability. 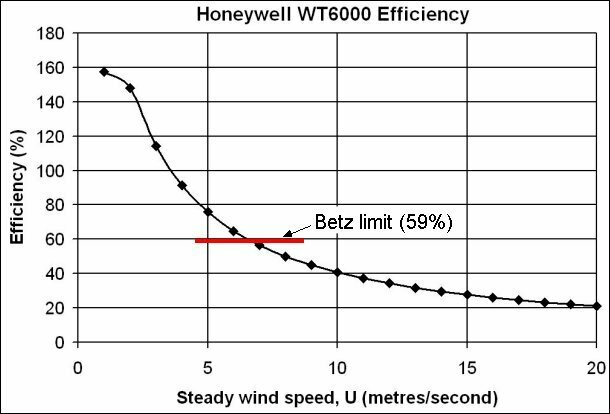 The figure below on the left is taken from the WindPower program and shows the certified Bergey power curve and the resulting efficiencies (aka power coefficients) of the turbine. The power curve in the Bergey certificate extends only to 20 metres/sec so that the power curve has just been extrapolated downwards from 20 to 30 metres/second as a rough reflection of the decrease in power due to the furling action of the tail fin. The efficiencies (i.e. power coefficients) of the earlier Bergey Excel were quite low with peak values of around 13% but, with the newer design, the efficiencies are now close to 30% over quite a wide range of speeds. This is a measure of the improvements in performance that can be achieved through careful blade design and improved control electronics. The curve on the right shows the mean power that can be expected from a Bergey Excel turbine for a range of mean wind speeds assuming a Rayleigh wind speed distribution. For those interested in annual energy production, this is easily obtained by multiplying the mean power by the number of hours in a year (i.e. 8,760). The table below shows the annual energy production based on the mean power curve. Agreement between the WindPower calculations and the MCS data is close. Because the WindPower power curve has been extrapolated to higher speeds than the MCS data, the WindPower results lead to slightly higher annual energy production figures than the MCS data. The Skytream is a small US three-bladed downwind turbine (no tail fin) manufactured by Southwest Windpower in Arizona. It has been developed over a period of several years in conjunction with the National Renewable Energy Laboratory in Colorado. It was called the Storm turbine originally but, with modifications, it was renamed the Skystream. It is a 3.7 metre diameter turbine with a peak power output of 2.4 kilowatts and has received the UK's Microgeneration Certificate. 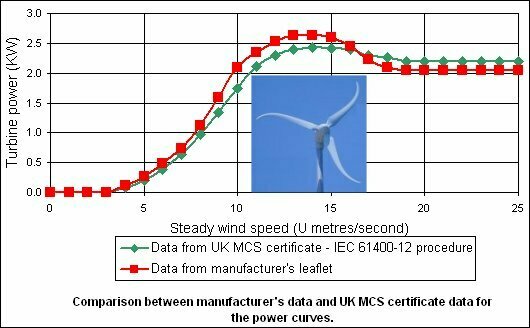 This certificate is available from the Skystream website and in the figure below is shown a comparison between the power curve from this certificate compared to the power curve from earlier manufacturer's leaflets. It was not stated in these leaflets how the earlier power curve was obtained but, by reference to the NREL report on the Skystream, it may have been obtained by taking either 20 second averages or possibly 1 minute averages. It demonstrates how the processing of analysing the fluctuating data influences the apparent power curves. In this case, the effect is not large but it does show how important it is that a consistent testing procedure should be followed if valid comparisons are to be made between different wind turbines. Control of the rotational speed and the power output of the Skystream is by electronic control of the generator which can also be used to stop the turbine altogether either because the wind speed has risen above 25 metres/second or because there has been a failure of the grid to which the Skystream is connected. It also has a back-up safety braking system if the normal braking system should fail for any reason. Generally, the turbine seems to have been carefully developed as one might expect from an association with a large government research and testing laboratory. The figure below shows the WindPower plots of the power curve and efficiency on the left and the resulting mean power on the right using a Rayleigh probability distribution for the wind speed. The peak efficiency of the Skystream is just under 30% which is a very reasonable value and it maintains this level of efficiency over quite a broad speed range from, say, about 5 to 11 metres/second. The table below shows the mean power results from the WindPower program converted into annual energy production. Also shown is the energy production figures taken from the UK's Microgeneration Certificate. Up to 7 metres/second, the agreement with the WindPower estimates is within a percent but the differences increase until the WindPower results are just over 10% higher than the Microgeneration Certificate values at 10 metres/second. Without knowing in detail how the Microgeneration Certificate calculations for this particular certificate were carried out, the reason for this difference cannot be established but it should be noted that the accuracy of the present numerical integration scheme has been carefully checked and one should not expect differences of greater than one percent - see web page 16 on the calculation of mean power. Also shown are the annual energy figures from an earlier Skystream leaflet. Once again, the figures are in good agreement at the lower speeds but diverge more at the higher mean speeds of 9 and 10 metres/second. So, even before the issue of the Microgeneration Certificate, the Skystream data was reasonably consistent. http://www.windtronics.com This is a new wind turbine in the small wind turbine market. 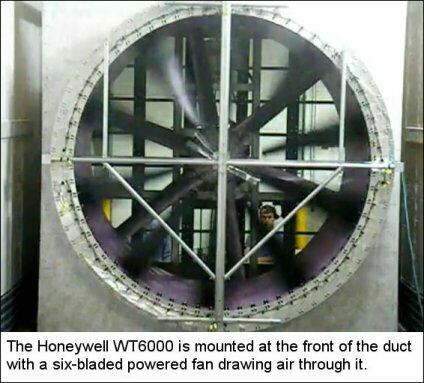 Honeywell is a large and reputable company and so one would expect this turbine to be well manufactured and backed up by reliable performance data. Unfortunately, the initial advertising material (including a launch video that can be seen on YouTube) does not seem to provide this. This is a shame because there are aspects of this machine which seem attractive but uncertainties about its power data casts doubt on its likely performance. The turbine is unusual in that it is a horizontal axis turbine of 1.7 metres diameter with apparently twenty blades. Counter to intuition, it should be noted that having a large number of blades does not confer any significant improvement in aerodynamic efficiency compared with a three-bladed or even a two-bladed turbine. The generator is housed in an annulus around the blades. It is claimed that this results in a low frictional resistance to rotation so that the cut-in speed is close to 1 metre/second. It is argued that this is a good thing in that the turbine will start to generate power at much lower wind speeds than a more conventional wind turbine. However, this is actually not very significant in itself because the power generated at these low wind speeds is miniscular - literally just a few watts. A more significant point is that the turbine seems able to operate over wide speed range up to to about 20 metres/second without any mechanical feathering of the blades. What happens above this speed is not altogether clear. The figure below shows an image of the turbine with what is apparently a steady speed power curve obtained from an advertising pamphlet Energy-Output-Power-Curve.pdf. The noteworthy feature of the power curve is that it shows an ever increasing power output with speed and apparently the turbine will produce a power of 2 kilowatts or more at higher speeds approaching 20 metres/second. 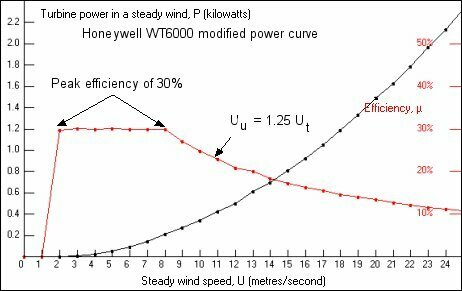 However, the figure below shows the turbine efficiency based on this power curve. Not only is the Betz limit exceeded but the efficiency rises above 100% at speeds below about 3.5 metres/second! Clearly, this casts doubt on the whole performance of the turbine. Initially, it was a puzzle to know how such data could have been produced. However, in some advertising material, the manufacturer mentions that a wind tunnel was available in which they tested the turbine. As mentioned at the beginning of this webpage, it would need to be a very large tunnel in order to avoid problems over blockage effects. From a later video, it now seems that the turbine was tested in what amounts to a duct. The figure below shows a still image taken from this video. Testing a turbine in a duct bears little relationship to testing it in free air and the power curve and efficiencies obtained in this way will differ greatly from those obtained in a free air test. As the figure below shows, the boundary conditions in the two case are completely different. 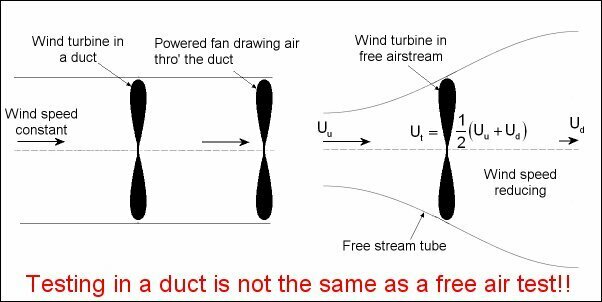 However, if we make the assumption that the flow through the turbine itself is similar in both cases then we could use the duct test results if only a relationship could be determined between the wind speed through the turbine Ut and the higher wind speed in the stream tube far upstream in a free air test Uu. The ratio of the downstream speed Ud to the upstream speed Uu is itself a function of efficiency. However, we see that the upstream speed Uu has a limit of twice the speed through the turbine Ut when the downstream speed approaches zero and a value of 1.5 when the efficiency is at the Betz limit when Ud/Uu=1/3. The ratio will certainly be less than either of these values and, for the rough purposes here, a rather arbitrary value of Uu/Ut of 1.25 will be assumed. The effect this has on the power curve can be seen in the figure below. However, it was still found that efficiencies at low speeds were too high and so the power curve has been adjusted so that the peak efficiency is clipped at 30%. Using the above power curve, the WindPower program has been used to calculate the annual energy outputs shown in the table below for the standared Rayleigh wind speed probability distribution. The price of the turbine is quoted at around $4,500 which seems quite attractive. However, as this turbine is aimed at installation on buildings in urban environments where wind speeds would probably be only around 4 metres/second, the payback period would be very long - in excess of ten years even with generous feed-in tariffs. This turbine has been included on this webpage as an example of how careful a potential buyer of a small turbine must be when faced with a manufacturer's claims about their wind turbine performance. It is a good illustration of how important it is that turbines should be subjected to a proper accreditation process. Next is a discussion on obtaining estimates of mean wind speed.